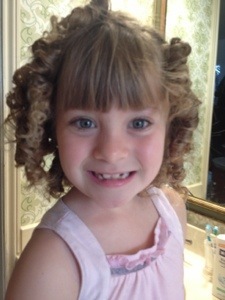 Ainsley wanted her hair curly for Easter. So last night we did a trial run. 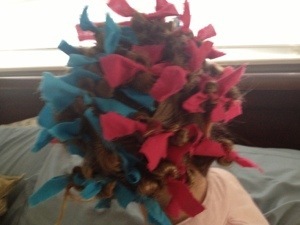 We couldn’t find any of the rollers that we bought for Madie, so we curled her hair the old fashioned way. 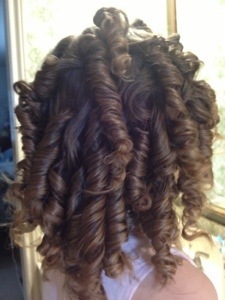 It worked and it looks great!!! Now we get to do it all over again for Easter. Now it is Madie’s turn. So on Friday, we went to the doctor to find out the results from all of the testing that we had to do on Madie. Wait, you say. Are you sure you have the right kid?, you say. Yes. Yes, I do. 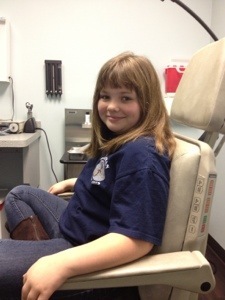 At Madie’s yearly check up, she failed her hearing test in her left ear. Thinking that it may be an ear infection, the doctor gave her antibiotics and told us to come back in a month to repeat the hearing test. So in January we went back and retested her hearing. She failed again. So that meant a trip to the ear, nose, and throat doctor . . . In February, she went to see Dr. Chimenti and his audiologist performed another hearing test, although this one was much more official. She failed that one too. Not just slightly . . . but significantly. She is severely deaf in her left ear and she has some hearing loss in her right ear. So what does that mean, doctor? It means that we need to find out why. So she had a couple of CT scans, blood tests, EKG, and other tests done at the hospital. And yesterday we heard the results. Her hearing loss is congenital. She was born that way. 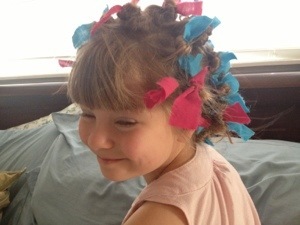 My mother and sister both have otosclerosis (another kind of hearing loss), but Madie does not. It doesn’t mean she won’t get it, but that is not why she has lost her hearing right now. The doctor doesn’t think that she will loose any more hearing, but we have to go back in 6 months and have it tested again. After two stable hearing tests, she won’t have to go back to the doctor for another year. The doctor said she can get hearing aids, but he said we need to wait until Madie thinks she needs them. Right now, Madie has been using her right ear and compensating well. She didn’t even realize that she had a hearing issue, so she doesn’t need the hearing aids right now. Maybe one day. Maybe not. We are to wait until Madie tells us that she needs them. He also said that her bad ear is the reason for all of her headaches this year. When it is loud and noisy (like middle school tends to be), she will get terrible headaches. So the doctor told her to put an earplug in the bad ear and it will help with all of the headaches. So now for the “ugh” part of yesterday’s visit, Madie’s EKG result came back abnormal. Her test said that she had “borderline intraventricular conduction delay.” Something about a prolonged QT interval. Not sure what it all means. Except that it means that Madie has to go see a cardiologist. Luckily we know a good one. Why does an ENT do an EKG on a kid with a hearing loss? Because a lot of kids who have a hearing loss as a child have a “syndrome” that also causes other health issues. So I called Ben’s cardiologist and even though she is not taking new patients, she agreed to see Madie. Thank goodness. Especially since the idea of explaining Ben to another cardiologist sounds exhausting and frankly . . . impossible. That is just my feeling right now. It will pass. It generally does. I didn’t make up these issues. I didn’t cause my children to have bad test results so that I could go to more doctors. We just smile at our children and tell them that in spite of it all that these were good test results. We make the followup appointment for labs and doctor appointments. We pull out our checkbook and pay the medical bills that constantly arrive at our home. We pray that our children can be healthy. We are thankful that this isn’t worse. We thank God that we still have our children and that we at least have a medical system to turn to. And then we go bed so that we can wake up and do it all over again the next day. So please pray for our little family. This heart thing with Madie will probably turn out to be nothing, but we will still go through the process to verify that it will be nothing. Madie is doing surprisingly well under all of this stress. She is a good kid. Ainsley is on a power praying regime. Every night she is talking to God about all of the kids she needs Him to fix. Levity and laughter are great healers! Thank you Ainsley for helping us to keep it all in perspective. Mark this day on the calendar. . .
We are 45 minutes early to our appointment at Texas Children’s. We are rarely early to the doctor. On time? Yes. 5 minutes late? Yes. Early? Hardly ever. So early that Ben has time to play on the indoor slide before we get called. Fabulous. Especially since he moaning about the routine blood draw he has to have today. It is good to have a little fun first!! I made this sign tonight before Madie and I headed out for our umpteenth booth sale. Chris asked me, “Are you hanging that up on the fridge?” “No,” I thought, but I should. We are so ready for this cookie season to be over. Madie has met her goal. Ainsley has met her goal. Chris has been absolutely supportive this season. We have been gone almost every weekend and a lot of week days for over a month. 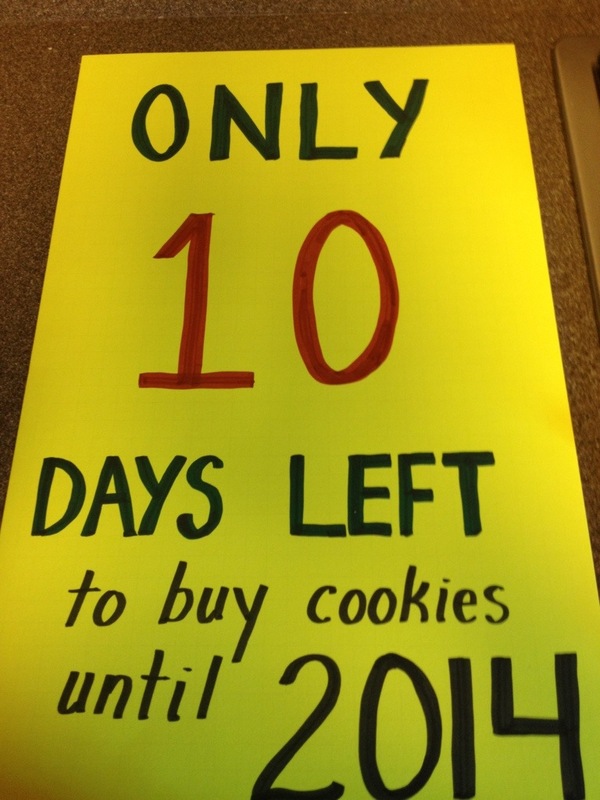 Our troop has sold almost 10,000 boxes of cookies. That is a lot of cookies. I say the word “cookies” and everyone’s eyes start to glass over. We love cookies. We love what they stand for. And most importantly . . . they are very tasty! Now we are almost to the finish line. 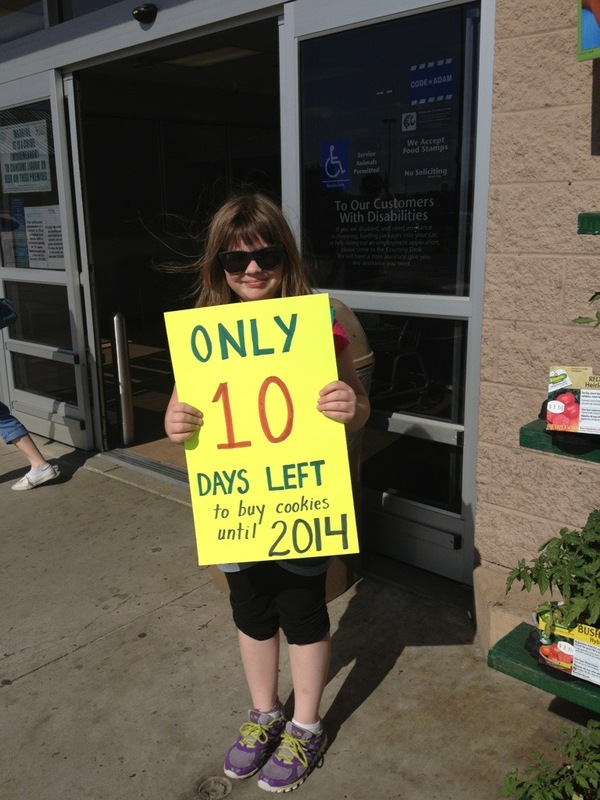 Madie has the whole cookie sale talking points down to a science. One person said, “I will give you two dollars if you don’t ask me to buy cookies.” Madie said, “Deal.” When the guy came out, he walked up to her and she didn’t say two words to him. He smiled, said “A bargain is a bargain,” and handed her two dollars (which she promptly stuck in the donation jar). But it is time to take this vast knowledge of cookie selling and store it away for another year. The girls have earned plenty of money to do all of the great things that they are planning on doing this year. They are using the money for camping and a big trip to Galveston this summer. But is also pays for patches, offset costs of other activities, supplies, and maybe an even bigger trip down the road. So please wish us luck. Or stop by and buy a box. Either way will be greatly appreciated. “I’m all ready. I’ve done my homework. I’ve had a bath. I’ve got my pajamas on. I shaved. I put deodorant on. I took my medicine. And I have good posture. I’m ready,” declares Ben. That boy is hilarious. How does he come up with this stuff sometimes? I think I can stop crying long enough to share . . . This awesome, fabulous, magnificent, most excellent news! Ben and Madie are going to Camp Pump It Up!!!! So we finally got the word today, that Ben and Madie (any siblings ages 9-12 are invited too) get to go to camp. As soon as I got the email, I started to cry. You know . . . the ugly sobbing kind. I am so happy for him. After our most recent visit to TCH, it was nice to finally hear something good to come out of this. Ben doesn’t really know anyone like him. 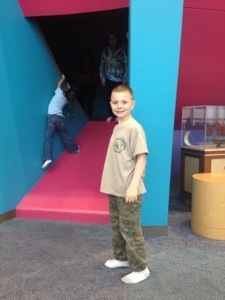 He’s met a few other kids, but all of them had surgery when they were first born. Never in the same boat as him. I think Ben considers himself pretty normal and rarely focuses on all of his illnesses. Of course, he doesn’t know any different. I am so excited for Ben and Madie to meet other kids who have lived lives like theirs. I know that there are kids who suffer worse than Ben, but Ben hasn’t had it easy either. I hope they come home with some new friends and some awesome experiences. And knowing those two . . . they will.